This time i had the idea to make a tutorial about what items to bring when you go painting outside your house. For example to a painting jam at a friends house, to a workshop or to a painters meeting. As i go at least once a week to Romans house with my stuff i already got everything packed up pretty mobile. 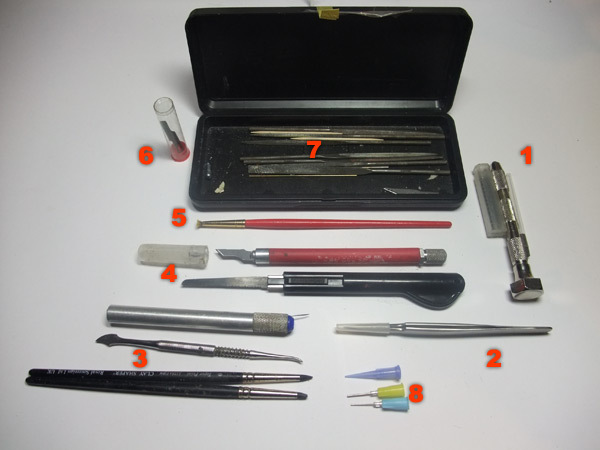 I will introduce my way of packing the stuff and a general overview of my painting and hobby essentials. When i'm talking about the essentials, this is what you really NEED when you leave your house for painting somewhere else. 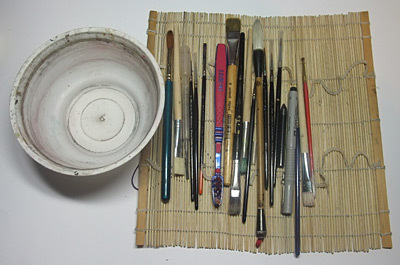 Also you can see a wide selection of brushes, good and fine brushes and older ones for suicide missions. Watch out! Don't let your Brush Tips get "touched" by anything, if a good tip gets bent because of this you will be angry!!! ahhhhh!! Second we have colors, it's sometimes hard to find something to put all your colors in to but when you have found something it's pretty cool.... you can see i painted dots of colors onto my cans so i can easily find them. 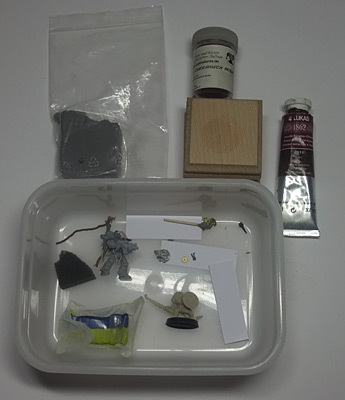 At the right side you see a selection of MIG pigments and in the front there are some Tamiya clear colors. I also have some snow with me (Andrea Snow) and some of my self made rust pigments. You should never forget to bring a light except when you know that the place is very well lit or you just want to sculpt. Forgetting the light is a real pain but asking others to share their light is a pain for both of the painters... so just don't forget it! 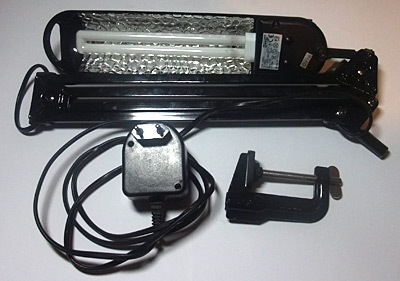 The lights i use are bought from ikea and the lamp was changed to a daylight bulb. But a palette is very important, sure you can also use something that lies around at the place.... But especially a wet palette is very nice to have! 4) Vallejo Plastic Putty - Very cool stuff, i use it for all kind of things, it hardens very fast (max. 5 minutes). 6) Plastic Booze glasses..... good for mixing large amounts of washes or other stuff. 11) Tootpicks, useful for all kinds of stuff! 12) Different types of cork for putting miniatures on. 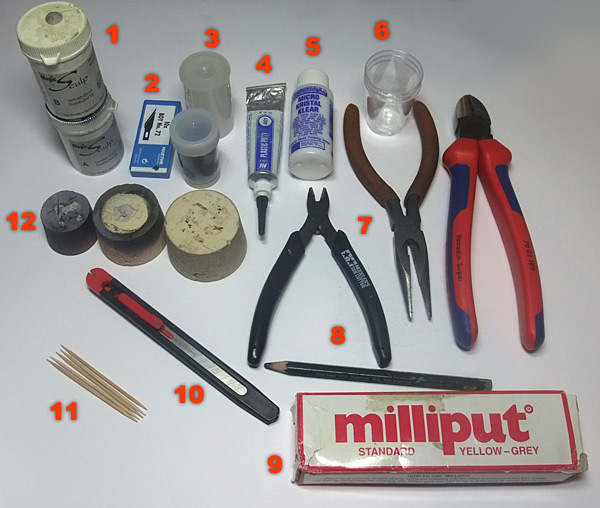 Ok, as you can see, most of this stuff is needed for preparing miniatures and bases. 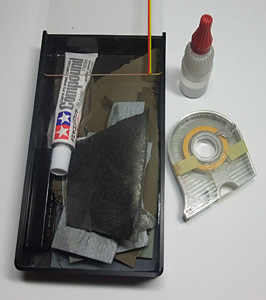 This is my sanding box, it containts different kind of sanding paper, Tamiya airbrush tape (always nice to have) and my superglue..... the superglue always changes between the boxes, it's also often in my color box. 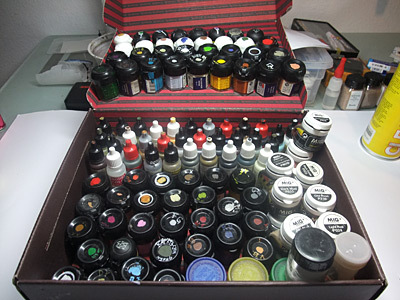 This box contains all kind of basing gimmicks that i love and i don't neccessarily find at the painting place. 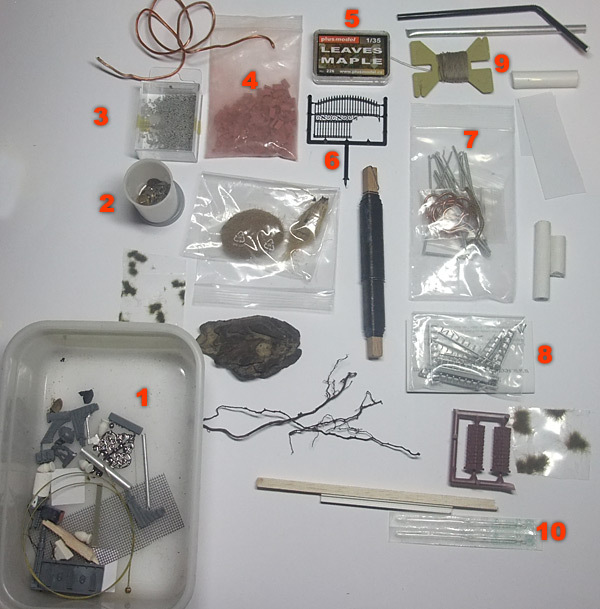 It just containts stuff that you kind find on the street in a normal city. 2) A little container with gears, cogs and little watch parts. You can see some other stuff ... but it's pretty much self-explanatory. So i hope this helps you a bit when you search your stuff for the next painting jam! 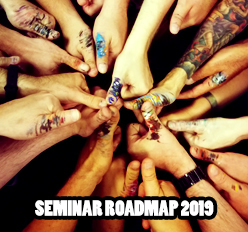 Very nice article with a great use for everyone... the Painter's Travel Guide, well done and thanks for the effort, but you are mixing things up - Painting Jam? I always thought that's me answering questions, not traveling around the globe with the Painters equipment... but who cares :) - love it! Those are for my superglue. now I know why you need the energy-drinks, shown some posts before. What do you use the "Tamiya clear colors" for? Are they similar to inks? Do they dry up glossy or matt? I've got everything on my painting area where I like it / it belongs... I couldn't imaging tearing it down all the time to travel with it. I like your setup, I have been considering picking up the Battlefoam hobby tool loadout for the same thing. I'd like to see a picture of all your stuff packed up/stacked up. I just store my paints upside down to see the colors. When I am ready to use them, just flip them right side up and give the container a good tap or two and open carefully. Or do you just use film containers? This guide can be a great source for instructions for the people who want to have a memorable trip around the world to give a preview of their art and skills to the people of the different regions of the world. Always interesting to see and read about other people's tools BTW.